"Louis Nagel is a consummate artist-teacher whose humility belies his extraordinary intellect and talent. 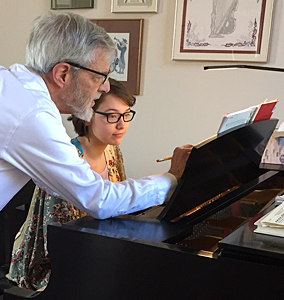 He encourages his students to dig deeper to truly understand the score and inform their interpretation while also fluent and effortless technique." Interested in serious piano study and building a repertoire. Preparing for a college music curriculum, focusing on music analysis (theory and form). Adults who put aside their piano studies when they embarked upon careers and are eager now to return to study. Adults are never "too old" to learn and enjoy the beauties of the great composers. Recent graduates preparing for recital programs. I believe that teaching music must include the "why" as well as the "how" to play a composition. For example, when preparing for a college audition, it is important to choose appropriate repertoire and understand it analytically as well as be able to perform it convincingly. For older students, who may have learned a repertoire with an incomplete understanding of its structure and history, I can offer them a deeper relationship with the music.